Epilepsy is a neurological disorder affecting approximately 1% of children. Approximately 25%–50% children with epilepsy have prominent behavioral features with sleep problems., As many as 80% of children with epilepsy manifest these difficulties,,,,, regardless of whether they are measured via parental report  or polysomnography. Despite the fact that the clinical association between pediatric epilepsy and sleep has been explored in a few earlier studies,,,,,,, our clinical comprehension of this association corresponds to a model in which sleep patterns influence seizure profiles and vice versa. Sleep impairment and circadian rhythms can predict seizure pattern. For example, obstructive sleep apnea and restless legs syndrome have been reported to interfere with the effective seizure control. Moreover, epileptic episodes appear to disrupt sleep–wake cycles, and some antiepileptic medications can adversely affect sleep structure and quality. Poor rest, for example, can similarly influence the execution of intellectual tasks. Therefore, we conducted this study to assess the effect of sleep patterns in children with epilepsy. The study included 34 children between 4 and 14 years of age, with a diagnosis of epilepsy and who were followed up in the clinic from October 2015 to March 2016. Participants were diagnosed with epilepsy through clinical assessment by a qualified pediatric neurologist and were classified according to the International League Against Epilepsy classification. The present study was conducted at the Pediatric Neurology Outpatient Clinic, King Khalid University Hospital, King Saud University Medical City, Riyadh, Saudi Arabia. Informed consent was obtained from all participants' parents or guardians before enrollment in the study. The study was approved by the ethics committee in our institute. The study participants were required to have stable medical and behavioral conditions, with no change in medication in the previous 6 months. Participants were excluded from the study if they had comorbid psychiatric disorders, such as autism spectrum disorder or attention-deficit hyperactivity disorder, significant vision or hearing loss, or a complex neurological disorder (e.g., cerebral palsy, neurometabolic disorders, neurodegenerative diseases, tuberous sclerosis, neurofibromatosis, and Rett syndrome). Parents were interviewed by trained medical students to recall sleep behaviors occurring over a recent “typical” week. Child sleep habits were measured using Children' Sleep Habits Questionnaire (CSHQ) scores., The CSHQ is an approved instrument for both behaviorally and medically based pediatric sleep difficulty. The CSHQ is a 33-item-based psychometric assessment for eight domains: bedtime resistance, sleep-onset delay, sleep duration, sleep anxiety, night awakenings, parasomnias, disordered breathing, and daytime sleepiness. A total score can be ranged from 33 to 99 based on calculation from all of the abovementioned domains. 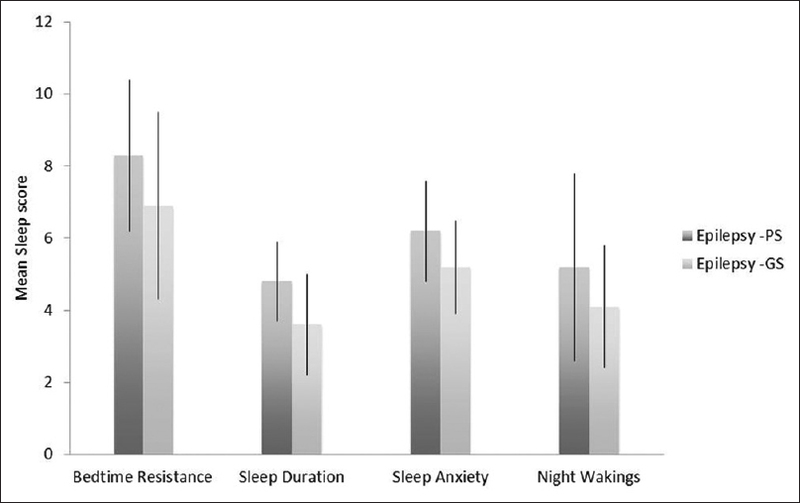 Higher scores are indicative of more disturbed sleep (epilepsy poor sleepers (EP-PS)). A score of 41 has been reported to be a sensitive cutoff for identification of probable sleep problems in children with epilepsy. Statistical analyses were performed using Statistical Package for Social Sciences (SPSS) version 23 (SPSS Inc., IBM, Chicago, Illinois, USA) on all variables (sleep variables, subjective sleep measures, and behavioral scales). P < 0.05 was considered statistically significant. Mann–Whitney U-tests were used for pairwise, between-group comparisons. Spearman's rank correlations (r) were used to evaluate the associations between all variables. Results were presented as mean ± standard deviation. The study comprised 34 children (20 boys and 14 girls), who were 4–14 years of age [Table 1]. Total sleep disturbance scores ranged from 32 to 48 (M = 40.00, SD = 3.63), with 44% of the sample (n = 15) meeting the diagnostic cutoff score of 41 for a sleep disorder and 56.7% (n = 19) falling below this cutoff score for CSHQ. Nineteen children with epilepsy were classified as epilepsy good sleeper (EP-GS) and 15 were classified as epilepsy poor sleepers (EP-PS), based on the CSHQ score by their parents. The sleep histories of all participants were reviewed. In the EP-PS group, 15 of 34 children had moderate-to-severe sleep problems expressed by parents. Night awakenings were a major concern in 23 of 34 children (67%). In the EP-GS group, eight parents rated their children as having no sleep problems (23%) and seven as having mild sleep problems (20%). Several children in the EP-GS group requested to go to bed at a scheduled time each night. All CSHQ domain scores differed significantly between the two groups [Figure 1] and were lower in the EP-GS group than that in the EP-PS group. Children in the EP-PS group were found to experience greater sleep disturbances compared to good sleepers according to total CSHQ score (P< 0.04) and the following CSHQ subscores: night awakenings (P< 0.03), sleep duration (P< 0.04), daytime sleepiness (P< 0.04), sleep-onset delay (P = 0.02), and bedtime resistance (P = 0.02) [Table 1]. Epilepsy can significantly affect the sleep patterns in the children. This finding is consistent with the relationship between sleep and epilepsy observed in older school-aged children  and adolescents. In this study, we found that waking up in the middle of the night (night awakenings), sleep duration, daytime sleepiness, sleep-onset delay, and bedtime resistance were the most common problems among pediatric population with epilepsy according to CSHQ. Although parasomnias are common in childhood – being present in >80% of preschool-aged children , – a marked association with epilepsy has been described by several ,,, but not all  previous studies. Mechanistically, hypotheses have suggested that epileptic seizures lead to sleep fragmentation, facilitating the subsequent occurrence of parasomnias.,,, Data on the association between epilepsy therapeutics and sleep problems are contradictory; while some studies support an association,, other studies have found no such association., To date, the clinical understanding of the effect of childhood epilepsy on parent and/or caregiver sleep is relatively limited. One limitation of the present study was its small sample size, which may have resulted in specific effects of CSHQ measurements between the good (EP-GS) and poor sleeper (EP-PS) groups being missed due to inadequate statistical power to detect significant changes. However, data from the present study may provide a basis for a larger, more focused study examining its promising elements. An additional limitation is lack of objective assessment of sleep in children. Our results suggest that sleep problems are known to be common among young children with epilepsy; the results of this work may provide the basis for focused studies to gain deeper understanding of sleep disturbances in this population. Sleep habits should be comprehensively reviewed when a sleep problem is identified in children with epilepsy. Owens JA, Spirito A, McGuinn M. The Children's Sleep Habits Questionnaire (CSHQ): Psychometric properties of a survey instrument for school-aged children. Sleep 2000;23:1043-51. Constantin E, Low NC, Dugas E, Karp I, O'Loughlin J. Association between childhood sleep-disordered breathing and disruptive behavior disorders in childhood and adolescence. Behav Sleep Med 2015;13:442-54. Maganti R, Hausman N, Koehn M, Sandok E, Glurich I, Mukesh BN, et al. Excessive daytime sleepiness and sleep complaints among children with epilepsy. Epilepsy Behav 2006;8:272-7. Batista BH, Nunes ML. Evaluation of sleep habits in children with epilepsy. Epilepsy Behav 2007;11:60-4. Byars AW, Byars KC, Johnson CS, DeGrauw TJ, Fastenau PS, Perkins S, et al. The relationship between sleep problems and neuropsychological functioning in children with first recognized seizures. Epilepsy Behav 2008;13:607-13. Ong LC, Yang WW, Wong SW, alSiddiq F, Khu YS. Sleep habits and disturbances in Malaysian children with epilepsy. J Paediatr Child Health 2010;46:80-4. Chan B, Cheong EY, Ng SF, Chan YC, Lee QU, Chan KY, et al. Evaluation of sleep disturbances in children with epilepsy: A questionnaire-based case-control study. Epilepsy Behav 2011;21:437-40. Lycett K, Sciberras E, Mensah FK, Hiscock H. Behavioral sleep problems and internalizing and externalizing comorbidities in children with attention-deficit/hyperactivity disorder. Eur Child Adolesc Psychiatry 2015;24:31-40. Virring A, Lambek R, Jennum PJ, Møller LR, Thomsen PH. Sleep problems and daily functioning in children with ADHD: An investigation of the role of impairment, ADHD presentations, and psychiatric comorbidity. J Atten Disord 2017;21:731-40. Becker DA, Fennell EB, Carney PR. Sleep disturbance in children with epilepsy. Epilepsy Behav 2003;4:651-8. Wirrell E, Blackman M, Barlow K, Mah J, Hamiwka L. Sleep disturbances in children with epilepsy compared with their nearest-aged siblings. Dev Med Child Neurol 2005;47:754-9. Montplaisir J, Laverdière M, Saint-Hilaire JM. Sleep and epilepsy. Electroencephalogr Clin Neurophysiol Suppl 1985;37:215-39. Nunes ML. Sleep and epilepsy in children: Clinical aspects and polysomnography. Epilepsy Res 2010;89:121-5. Placidi F, Scalise A, Marciani MG, Romigi A, Diomedi M, Gigli GL, et al. Effect of antiepileptic drugs on sleep. Clin Neurophysiol 2000;111 Suppl 2:S115-9. Goodlin-Jones BL, Sitnick SL, Tang K, Liu J, Anders TF. The children's sleep habits questionnaire in toddlers and preschool children. J Dev Behav Pediatr 2008;29:82-8. Liu X, Liu L, Owens JA, Kaplan DL. Sleep patterns and sleep problems among schoolchildren in the United States and China. Pediatrics 2005;115:241-9. Petit D, Touchette E, Tremblay RE, Boivin M, Montplaisir J. Dyssomnias and parasomnias in early childhood. Pediatrics 2007;119:e1016-25. Kotagal P, Yardi N. The relationship between sleep and epilepsy. Semin Pediatr Neurol 2008;15:42-9. Stores G, Wiggs L, Campling G. Sleep disorders and their relationship to psychological disturbance in children with epilepsy. Child Care Health Dev 1998;24:5-19. Cortesi F, Giannotti F, Ottaviano S. Sleep problems and daytime behavior in childhood idiopathic epilepsy. Epilepsia 1999;40:1557-65. Hoeppner JB, Garron DC, Cartwright RD. Self-reported sleep disorder symptoms in epilepsy. Epilepsia 1984;25:434-7. Zaiwalla Z, Stores G. Sleep and arousal disorders in childhood epilepsy. Electroencephalogr Clin Neurophysiol 1989;72:107.